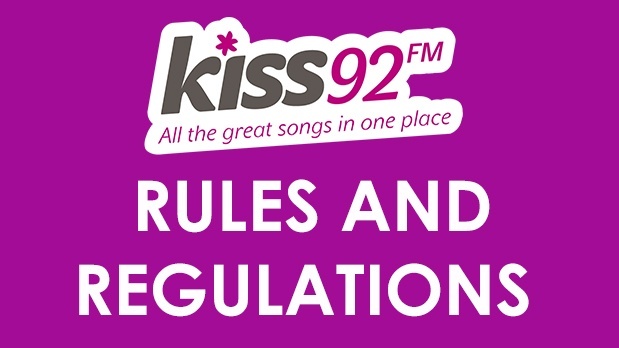 Kiss92 FM Rules and Regulations - All The Great Songs in One Place. All listeners may take part in Kiss92 contests unless there are specific requirements indicated by the organizers, advertisers or by law. Winners of contests will be automatically disqualified if he/she has won in the same Kiss92 contest / promotion within 30 days. Only one winner per household will be allowed to win a prize from Kiss92 of the any contest/promotion within 30 days. Some calls during contests are recorded and may be aired without further approval from the listeners. Contests that involve an alcohol beverage / club / pub sponsor are open to all listeners 18 years or older. Kiss92 reserves the right to revoke prizes if the winner does not meet any or all eligibility requirements, even though an announcement may have been made on air indicating that person was the winner. Prizes can be picked up at SPH Radio Pte Ltd located at 1000 Toa Payoh North News Centre Singapore 318994, with a valid SMS notification,' unless otherwise stated. Prizes will not be mailed. Prizes left unclaimed after the stipulated date will be forfeited. No correspondences will be entertained. All winners are required to show their original identity card/passport upon collection of prizes. If the winner is unable to collect their prizes personally, he/she may authorize someone to collect on his/her behalf with an Authorization letter. The authorized personnel must produce the winner's SMS notification, winner's Identity Card and his/her Identity Card. Only ORIGINAL Identity Cards will be accepted. Kiss92 reserves the right to substitute prizes of equal value, or end the contest at an earlier date. Kiss92 will not be held responsible' for any unforeseen cancellation or delay of concerts/events caused by weather, promoter or performer. The station's decision is final and no correspondence will be entertained.